From creative team McBoop, comes the story of a whiny rhino with a big head and an even bigger imagination. I loved this! It is going in my Girl Scout bag to read to the girls when we earn our "Courageous and Strong" petal. 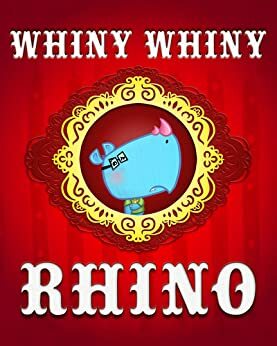 Written in iambic pentameter, Whiny Whiny Rhino follows the youngest Rhino in a family who listens to his older brothers tease him as he leaves the house, but who then refuses to do all the things his friends invite him to because of fear. Finally he realizes that the one keeping him from having fun is himself and he goes out to play with the other kids. I'd like to thank the publisher for making a review copy available via iRead Book Tours. Grade: A. Thank you so much for taking the time to read and review - we're so happy to hear that you enjoyed the book's message and that it will be useful to read to your Girl Scouts!